We get it – your data isn’t exactly where you’d like it to be. Perhaps your efforts to become more data-driven in your marketing and sales are often frustrated or stymied by data issues. You might be in the midst of a data cleanup effort with IT and new system architectures that seems never-ending. You might be struggling with null values in your data, poor linkages between data sources, such as the link between marketing, sales, and transaction data. The reality is that no organization’s data is perfect, nor even as good as many within the organization might like it to be. The good news, however, is that you can still put the limited data that you do have to good use. In fact, we’d contend that the cost of messy data is far lower than you might think, and certainly far lower than the cost of doing nothing. 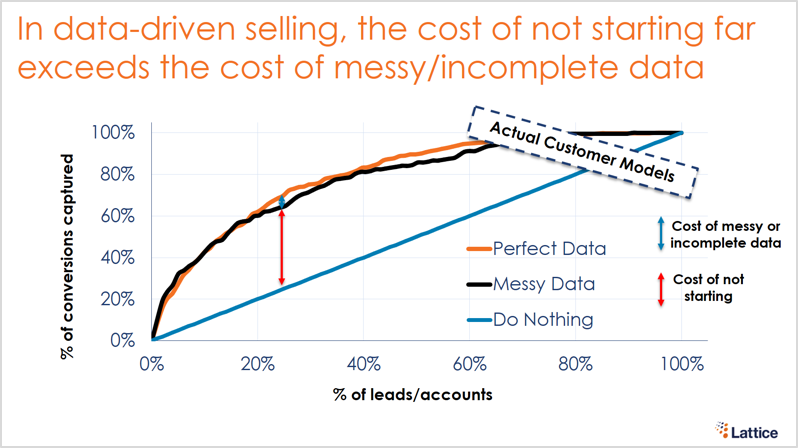 To illustrate this point, we took the data that we used to build a conversion model for a Fortune 1000 software company and removed half of the successful conversions, effectively simulating the messy and incomplete data that we often see in our customers’ databases. While the model quality did decline slightly, Lattice’s Predictive Insights Platform was still able to provide significant value, by predicting roughly 60% of the conversions in the top 20% of the leads. 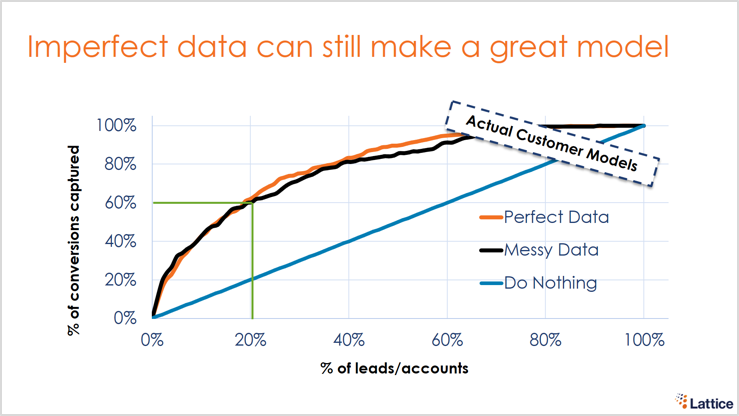 In the below graph, the orange line represents the model with perfect data, the black line represents the model with messy data, and the blue line represents a non-data-driven approach to sales and marketing, with each lead receiving equal treatment. This chart also serves to illustrate another key point – the cost of doing nothing. As you can see, while there is a small gap between models with perfect data (orange line) and the black line (imperfect data), there is a much larger gap between an undifferentiated approach (blue line) and both the orange and the black lines. Therefore, you can see that its’ a more cost-effective decision to move forward with slightly messy data, rather than wait longer and hope that someday you’ll have perfect data to work with. 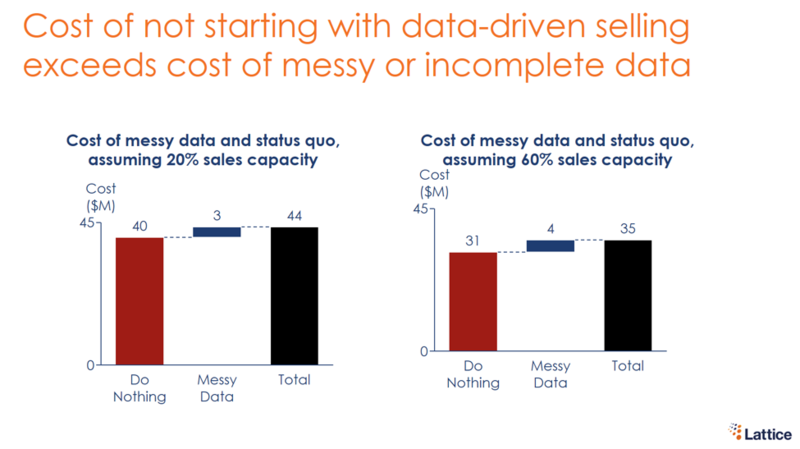 As you can see by the difference in the red bar and the blue bar, the cost of not starting is higher than the cost of messy data, even if your organization has significant sales capacity. Indeed, the cost of doing nothing, especially for the sake of imperfect data, is in the tens of millions of dollars. At Lattice we are proud of our track record of helping customers capture the value that exists in their data. You can see some of these real life stories in our customer testimonials. As the saying goes, a journey of a thousand miles begins with a single step. While your data may be getting cleaner, it will never be perfect, and there’s no time like the present to start using your data to make better decisions – as your data improves, so can your program. We’re excited to help marketing and sales teams get closer to true data-driven marketing and sales. If you are not Lattice customer and would love to learn more about how we can help improve your efficiency no matter the state of your data, please reach out to us here. This is the first in a series of blog posts where we will explore the importance data has on the revenue impact marketing and sales programs can have within an organization. Check back in a week for the next installment!